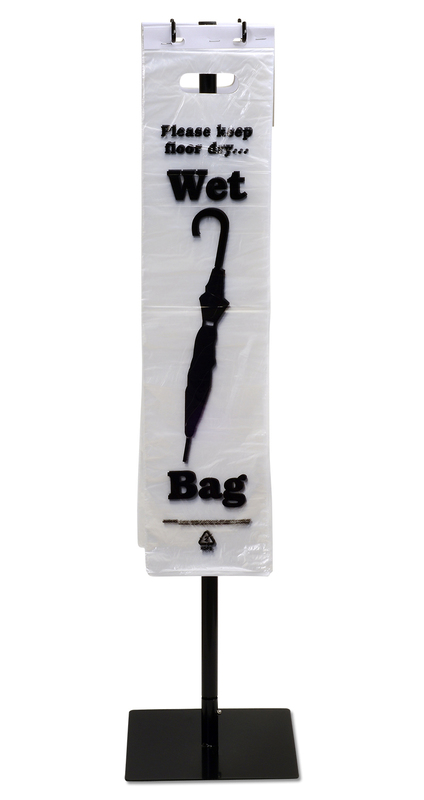 Portable stand and bags to keep floors dry and help prevent slip-and-fall accidents, reducing liability lawsuits. Offer customers or visitors a welcome service. Packed for easy display and includes die-cut handle. Fits virtually all sizes of umbrellas. Stand is made from powder-coated steel, with plastic feet on base to prevent damage to floor. Hooks on both sides of stand allow for bags to be displayed in two directions. Bags are recyclable.